Develop your musical skills and knowledge with Christian professors who encourage your creativity and relate faith to the art and craft of music. Engage in the serious study, composition and performance of great music at an advanced level. Discover the vital role music plays in the liberal arts and the Westmont community. Choose from the general, music performance, and music composition tracks or earn the professional Bachelor of Music Education (B.M.E.) degree that leads to a public school teaching credential. Study at a school accredited by the National Association of Schools of Music (NASM). The Westmont College Choir and Chamber Singers perform in Santa Barbara before they embark on their first tour of the East Coast. The singers will perform a wide variety of music, including works by Ola Gjeilo, Eric Whitacre Randall Thompson and Carly Simon at the Spring Choral Tour Concert Friday, April 26, at 7 p.m. at First United Methodist Church. Tickets, which cost $10 for general admission (students are free), may be purchased at the door or by clicking below. For more information, please contact the music department at (805) 565-6040 or email music@westmont.edu. In May, the choir will visit Washington, D.C., Philadelphia, New York, Connecticut and Boston among other cities, performing songs that draw on themes such as stewardship of the Earth and grace and mercy. “The repertoire will bridge a wide range of styles, both historic and modern, and feature works by Bach and Mendelssohn to Randall Thompson and Eric Whitacre,” says Michael Shasberger, Adams professor of music and worship. You will not want to miss out on this amazing concert series. Purchase tickets to our Select House Concert Series through the link below. Westmont’s principal choral ensemble and touring concert choir, is under the direction of Dr. Michael Shasberger. The choir performs the classic repertoire of the past five centuries, along with spirituals, folk song arrangements, and music of other cultures. The ensemble presents local concerts including, each year, a major work with orchestra. The College Choir also appears at Westmont events, performs in chapel, ministers in local church services, and participates in regional choral festivals. Highlights of the year include the Christmas concert and the spring tour. To learn more about the College Choir, please see this link. This select ensemble, under the direction of Dr. Grey Brothers, specializes in a cappella literature, including madrigals and motets of the Renaissance, contemporary sacred and secular music, folk song arrangements, spirituals, and vocal jazz. Community outreach is central to the ensemble. In addition to performing alongside the College Choir, the Chamber Singers performs on its own locally and across Southern California and the Central Coast. Performance highlights include the Fall Choral Festival, the Christmas Concert, the Spring Choral Masterworks Concert, the fall and spring Vocal Chamber Concerts, and the spring tour. Membership in the Chamber Singers is contingent upon membership in the College Choir. The Westmont Choral Union, under the direction of Dr. Grey Brothers and Dr. Nichole Dechaine, provides a choral music opportunity for all Westmont students who are not members of the Westmont College Choir. It is open to all without audition. Geared primarily toward first-year students, the ChoralUnion focuses on choral music fundamentals and provides opportunities for large mixed, single-gender, and chamber ensembles. The ChoralUnion performs a wide variety of repertoire in various configurations and collaborates with the Westmont College Choir. Performance highlights include the Fall Choral Festival, the Christmas Concert, the Spring Choral Masterworks Concert, and the spring Vocal ChamberConcert. The College Orchestra, conducted by Dr. Michael Shasberger, performs original literature, transcriptions, and arrangements. Included in this are works for full orchestra, string orchestra, and small ensembles. The study and practice includes various style periods and composers from the Renaissance through the Twenty First Century. The orchestra performs two major independent concerts each semester, as well as a combined Christmas concert with the choral ensembles and a major works program in the spring with the College Choir and plays for the annual opera production. Typically, the orchestra is made up of circa 60 students. Faculty specialists coach each section of the orchestra, including Dr. Han Soo Kim (violin), and Dr. Paul Mori (wind, brass and percussion). Various Wind Chamber Ensembles, directed and coached by Dr. Paul Mori, are organized for brass, woodwind, and percussion players. The various chamber ensembles perform throughout the semester. Typical groups include a woodwind quintet, 5 brass sextet, brass choir, and flute ensemble. Other ensemble forms to meet student interest and abilities. The Jazz Ensemble performs and studies classic and contemporary literature, including the art of improvisation, and perform both on and off campus. A wide range of music from contemporary jazz to hymn arrangements mixed with classical pieces. Offering traditional string quartets, trios and other ensembles. These groups have an active presence on campus and throughout the Santa Barbara community. Westmont College would love to offer you the opportunity to participate in our Fall Westmont Invitational Choral Festival. The focus of the festival is pedagogical and performance oriented, NOT competition. Choral Festival: October 2019. Festival date to be determined. 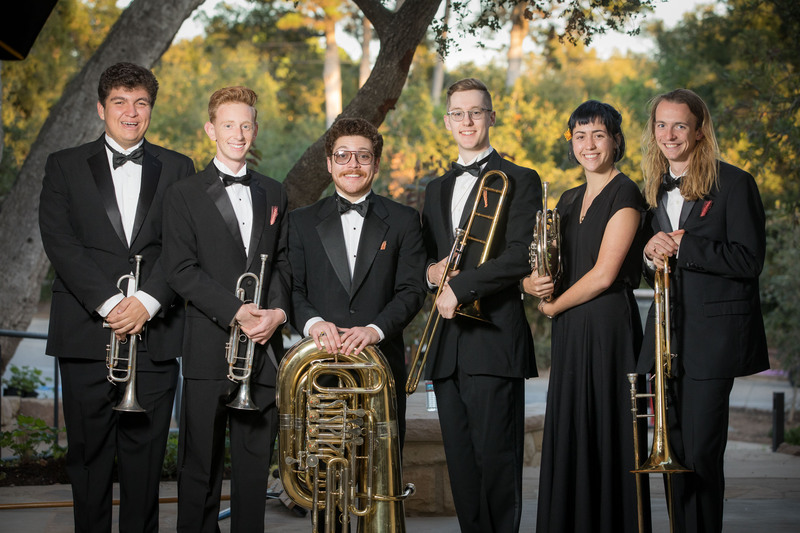 The Westmont Academy For Young Artists presents a marvelous opportunity for students to sharpen their skills, meet musical friends, forge relationships with top-quality artist teachers, and infuse their summer with a dose of inspiration. The setting is beautiful and the music making is alive with spontaneity. Our distinguished teaching faculty consists of outstanding singers, choral conductors, and teachers, who will teach, inspire, and mentor the students in their lessons, performances, workshops, and classes. In addition to daily lessons and classes in musicianship, students will perform in recitals, participate in the academy choral ensemble, and attend master classes dealing with such topics as vocal technique, repertoire, artistry, and language and diction. These individuals and families forge personal relationships with Westmont musicians. For a donation of $100, you receive a photo card of your adopted musician and an invitation to special receptions throughout the year. Individuals, families and foundations contributing $100 to $299 receive one season pass good for the following concerts: Fall Orchestra Concert, Concerto Concert, Spring Choral Masterworks, and the Spring Orchestra Concert. Patrons will also have their name appear in the program as a dedicated donor to our music program. If the donation is received before October 1st, 2018, you will also be included in our Christmas Concert invite mailing list where you may RSVP for up to four Christmas Concert tickets. Individuals, families and foundations contributing $300 to $499 receive four season passes plus all of the Patron benefits. Benefactors also get to *adopt one musician of their choosing! Individuals, families and foundations contributing $500 to $999 receive four season passes plus all of the Patron benefits. Guardian Angels also get to *adopt two musicians of their choosing! Individuals, families and foundations contributing $1,000 or more receive four season passes plus all of the Patron benefits. Program Sponsors also get to *adopt two musicians of their choosing! In addition, they choose a program during the year to sponsor, and their name will appear on the program as the concert sponsor. We couldn't do it without you! This organization includes individuals, families and foundations that make significant financial commitments of $5,000 or more annually for the future of the music program, supporting music scholarships, the acquisition of major instruments and special projects. We always welcome inquiries; you may call us at (805) 565-6040. *If you've donated at the Benefactor, Guardian Angel, or Program Sponsor level and have not yet adopted a musician as part of your giving benefits, please call (805) 565-6040 or email music@westmont.edu for assistance. You may also visit our Adopt-A-Musician table at the next concert you attend. To charge a gift by phone please call (805) 565-7053. Gifts to Westmont are deductible for tax purposes as allowed by law; the charitable amount of your contribution is limited to the amount in excess of the fair market value of the season pass(es) you receive as a result of your contribution. For more information or to give without receiving the benefit of a season pass, contact Zac Landrum at (805) 565-6271.